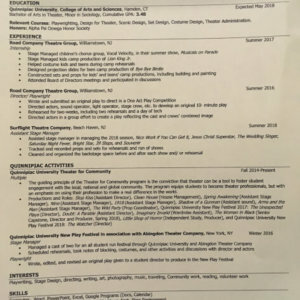 Resume posted by VictoriaW96 in Theatre. I attended Quinnipac University, recently graduating with a BA in Theatre Arts. During my time at Quinnipiac, I participated in roles such as directing, playwrighting, stage management, producing, set design and construction, prop design, and more. I have experience working on multiple productions at once. I took classes that focus on both the artistic, as well as administrative aspects of theatre, including Theatre Administration, Directing for Theatre, and Set/scenic design. In 2017, I participated in an internship at the Grand Theatre in Williamstown, New Jersey, which I stage manager 2 children camps (ages 8-18), as well as helped with costumes, sound, set construction, and prop preparation. Currently I am an Assistant Stage Manager at The Surflight Theatre in Beach Haven, New Jersey. My job includes, but not limited to, prop and set tracking, organization of backstage during and after rehearsals/ shows, and running backstage during performances.